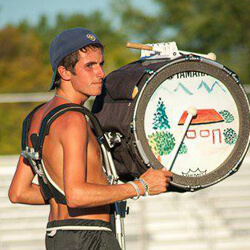 Samuel Schaefer, 20 Music Performance and Recording Technology at Grand Rapids Community College WGI: Genesis Percussion 2 years, NorthCoast Academy 2 years DCI: Madison Scouts 2012 Bass Drum When I think about all of my different audition experiences in indoor and outdoor, these are the things I learned during and after many of my experiences that I found extremely valuable for my own successes in the audition process. 1. Decision. Choose a drum corps wisely. Make a list of all the things you value and would expect from an ensemble like a drum corps. It could include style of show design, music or marching technique, instructional staff members, members in the corps, tuition, location, etc. Whatever holds the most weight in your decision, make sure the drum corps you choose matches this the best it can. For me, I value the musical writing style, instructional staff, and the vibe of the ensemble and the people I am marching with. Obviously you cannot tell what the vibe of the membership is like until you come to an audition camp, but asking veteran members you may know can give you a good idea before you commit. 2. Preparation. Do everything in your ability to be prepared. Read the technique packets distributed by the corps in great detail, study your performance, take videos and critique yourself. Talk to music educators and ask them to spend some time listening and watching you play and march. Talk to corps members. The marching community is much smaller than you'd think, and you will most likely already know someone or of someone in the corps. Returning members love to give advice to anyone who is interested in their corps! 3. Attitude. Obviously before you attend an audition, be positive but critical of yourself. Set high standards for your own playing so you will be prepared. Once at an audition, attitude is crucial. Everyone comes from different backgrounds and nobody does the activity EXACTLY the same, so be open minded! For the entire weekend, be attentive and open to learning whatever the staff asks of you. Also be calm and friendly. Meet as many people as you can, and enjoy yourself while you are there. The drum corps experience is a very social one, so making friends can help you get through nervous and uncomfortable audition feelings. While auditioning, being open and calm will help you play better and be more attentive to what the staff is teaching. Keeping your mind busy and nervous will not allow you to pick up concepts as fast. Despite how intense an audition may get, the staff members are looking for the best players to join the ensemble, so why would they be against you? They want you to play your best because they want great people to march in their corps! 4. Dedication. To grow as a performer and to ultimately make the ensemble, you will need to be dedicated. In between auditions, the amount and quality of your preparation will decide your dedication level. E-mailing and talking to instructional staff after camps is a great way to get more advice. Sending in videos in between camps also will prove how much you want to join the program. But even while at the audition, being prepared, working hard after the rehearsal blocks, and improving throughout the camp are all great signs to a staff member that you are dedicated. Buy into the entire program in order to be successful. If you have chosen the right drum corps for you, this should be very easy. 5. Determination. And lastly but most importantly, you must be determined. Maximizing the other four categories should be all you need to possess this one. But being determined to make a drum corps takes a lot of work. Despite whatever struggles you come across, deciding you want to receive a contract and taking the initiative to earn a spot in the corps is most important. This involves getting to an audition and then working extremely hard at the camp and before the next one. Finding ways to work and raise the money to march in the ensemble also is important. I promise, if you are determined enough, you will find yourself marching as a member of the ensemble you set out to audition for. It may be easier for others, or harder for others, but all that matters is how much you want to make the drum corps. I decided to audition for the Madison Scouts as soon as the auditions and staff were announced for the 2012 season. I knew I wanted to be a part of that program, and I was going to do whatever it took. I prepared all the music, and I had been saving money to pay tuition if I made it. When the camp weekend arrived in November, two of my friends from my area who were my mode of transportation to the camp backed out that Thursday night. I asked friends for help, posted on the Scouts' website, Twitter, Facebook group and online forums with the hope that someone nearby could give me ride. Without luck I began to search for last minute airfares and trains and buses, all which were way more expensive than I could afford at that moment. I also e-mailed the director, Dann Petersen, and asked him if there were any ways of getting me to the camp. He told me about the bus they were driving from Wisconsin to Indiana for the camp the Friday of the weekend, and he told me if I could get anywhere in its route, I could ride with them. Still unsure about how to get to that route, I continued to search for alternatives. Right at that moment, an old high school friend updated her Facebook saying, "I cannot wait to be picked up from school for Thanksgiving by my parents!" She went to school in Illinois, six hours from me, but I immediately called her, and her parents who lived in my hometown gladly accepted my request for a ride. They kindly took me to Champaign, Ill., where I waited 12 hours in a Starbucks, drumming on a pad while eagerly anticipating the arrival of the Madison bus. They picked me up, and got me to the camp. That one opportunity led me to getting a callback audition, followed by a contract and a spot in the corps. Even before getting contracted, the experience of getting to that first camp was all worth it the moment I got on that Madison bus in Illinois. Determination may take sacrifice and it may mean loss of energy and sleep. It will definitely take time and money, as I ended up working three jobs while attending school to pay for my tuition. But determination will take you to your goal. If you have the desire to at least see what drum crops is like, go to an audition. Don't allow yourself to not attend. Don't create reasons why it's not possible. The experience is incredible, and I have learned so much about myself. You owe it to yourself to give it a shot. View additional audition tips, and learn more about corps audition dates, locations, and more.